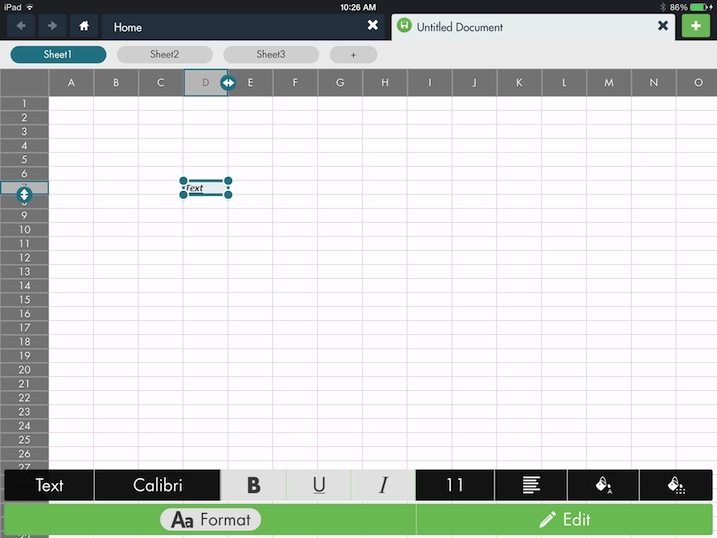 This article covers how to use the formatting toolbar when editing an Excel document with hopTo. 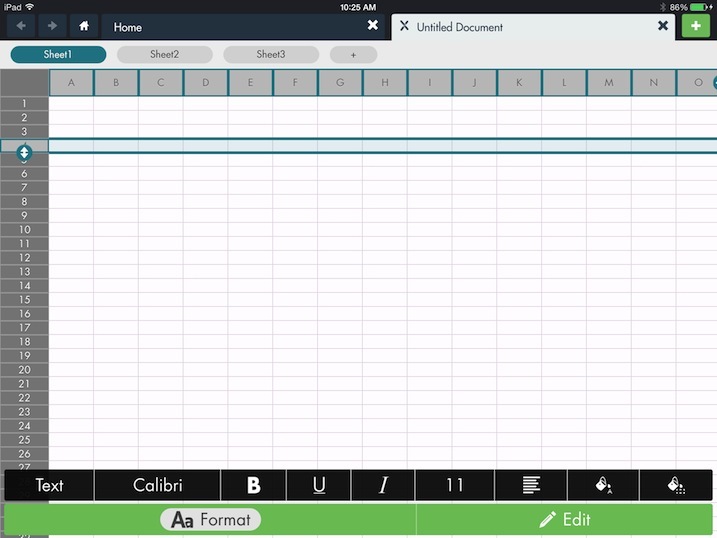 To edit a Microsoft Excel document using hopTo, please refer to following article: Editing a Microsoft Excel Document From the hopTo App. Except for when editing the content of a specific cell, the formatting toolbar is available at the bottom of the screen whenever the Format tab is chosen on the menu bar. In the image below, you can see the toolbar that pops-up with buttons for the supported formatting functions. 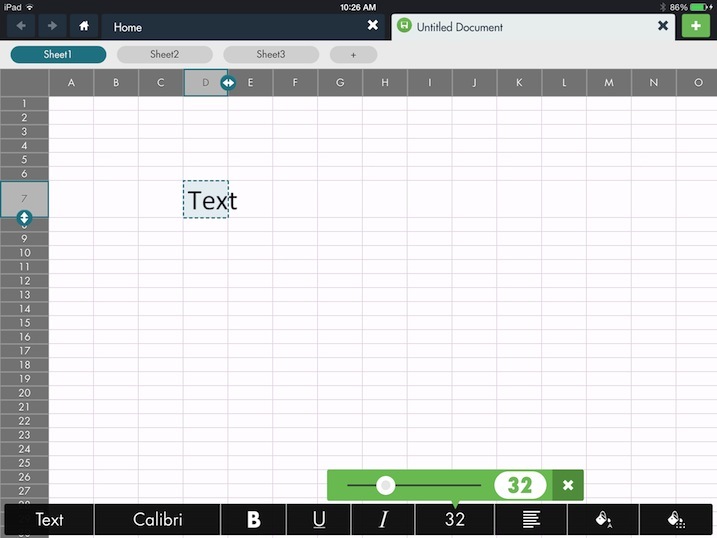 You can use the toolbar to make changes to single cells, cell blocks, entire rows, or entire columns. To pick a single cell, simply tap the cell once. To designate a cell block, tap the single cell where you would like to start creating the block. Tap and hold one of the dots on the edges of the cell, drag it, and release to create the block. 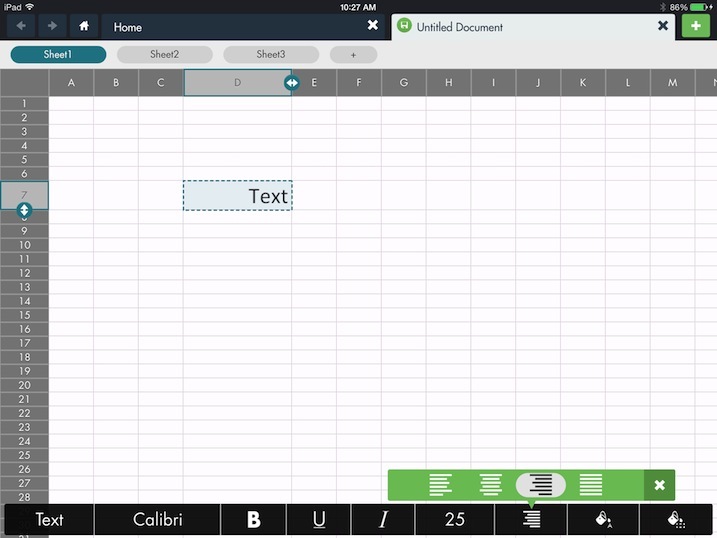 Tap a row number to select an entire row. Tap a column letter to select an entire column. 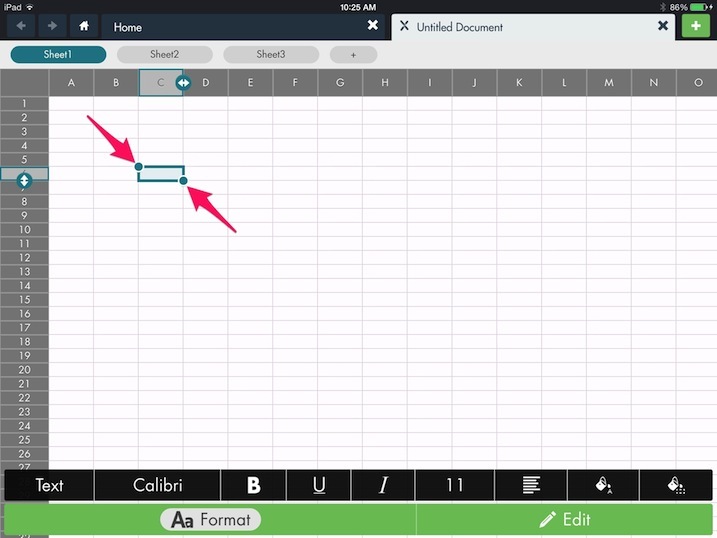 When you highlight a cell by tapping on it, the name in the cell type button on the toolbar shows the cell type. Tap the cell type button to change the data type. To close the type picker and return to the normal toolbar view, tap the “X” on the right-hand side. You can do the same operation for a block of cells (see above how to select a block, row, or column). Note that when selecting a block of cells with mixed types, the type showing inside the type picker will not represent all cells. The name the font button represents the current font. Tap the button, and the toolbar switches to the font picker. You can swipe right and left to see the available fonts, then tap the one you want. 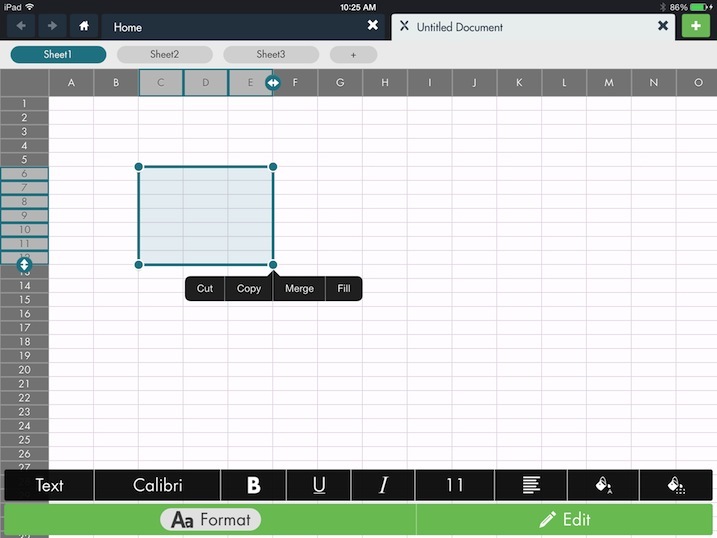 To close the font picker and return to the normal toolbar view, tap the “X” on the right-hand side. You can change a single cell or a block of cells to be bold, underlined, or italicized. The buttons become highlighted in white when selected. The number in the font size button shows the current font size. Tap the button, and a font size adjuster appears. Use the slider to adjust to your desired font size. To close the font size adjuster and return to the normal toolbar view, tap the “X” on the right-hand side. The text alignment indicator shows the current alignment. Tap the button and an alignment picker appears. 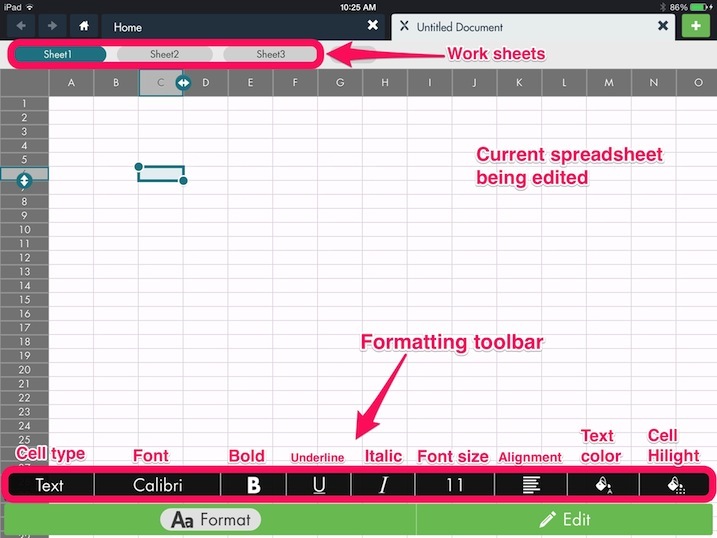 To close the text alignment picker and return to the normal toolbar view, tap the “X” on the right-hand side. 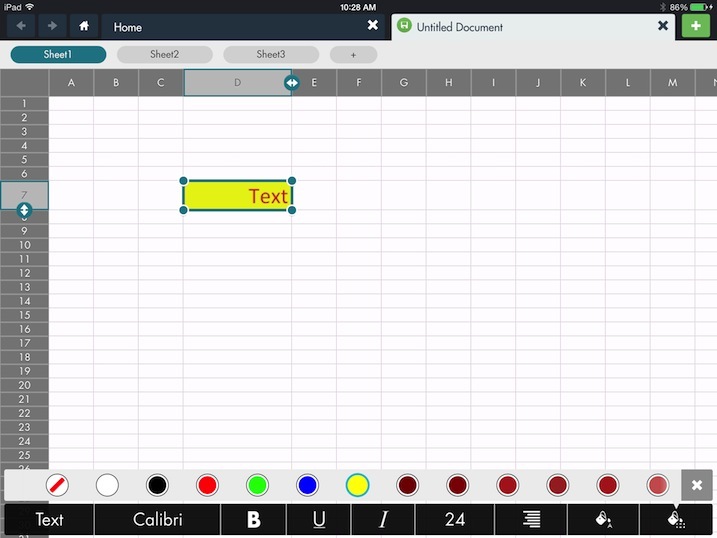 The text color option in the Format toolbar allows you to pick the color for the text in the designated cell range. Tap the button and the color palette will open with the available colors. Tap the color you want for your text - the selected color is surrounded by light blue. You can swipe the palette left and right to view more available colors. The cell background color option in the Format toolbar allows you to pick the background color for the selected cell or cell range. Tap the button and the color palette will open with the available colors. Tap the color you want to use - the selected color is surrounded by light blue. You can swipe the palette left and right to view more available colors. Borders are not yet supported. Also, there is no current option to select all the cells in an entire spreadsheet. I need to know how to continue formatting. How do you Merge & Center? How do you put a border around each cell? How do you format the entire sheet style?